We run special interest walking tours which can be booked as a private tour. The Haunted History Tour offers a unique insight into the towns dark and often mysterious past while the Gourmet Walking Tour marries the history of the town and Irish food with tastings of some of the wealth of local Clare produce available. Haunted History Tour – Unlock the darker side of medieval Ennis on this Haunted History Tour. The towns chilling history, mythology, ghosts and more are all explored as we make our way through the atmospheric winding streets and bow-ways of the town. Of all the counties in Ireland Co. Clare is one of the richest in lore and legendary tales with many of the world’s most famous supernatural characters and stories finding their roots in the tales told across the centuries by our ancestors. Hear about the mythology and legends of the town – from tales of the banshee and death coach to the witch Biddy Early and her magical blue bottle. Discover the secret side of the towns past – the grime, crime and grim punishments. From tales of the Mad Monk to graveyard excavations this unique tour will reveal the town in a whole new light. Popular with both adults and children alike this historically accurate tour is an ideal activity for group or corporate events or anyone who enjoys reliving the experience of our dark past. to the fascinating history of Ennis also offers an insight into the history of Irish food and how food and attitudes to food have shaped Irish society. 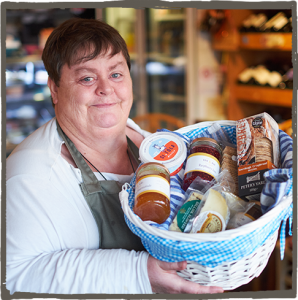 From the simple diet of our ancestors and the enormous impact of the potato famine to the modern Irish cuisine of today the tour also includes a stop along the way at the local market (if possible) and local food suppliers to taste and learn more about the wealth of local produce available including Clare Farmhouse Cheeses, Burren Smoked Salmon, Clare Jam, Chocolate and more. The Gourmet or Haunted History tours can be arranged for a weekday or weekend, day or evening. Tours normally take between 60 and 75 minutes to complete but this can easily be adapted to suit your schedule. We normally walk approx. one mile at a moderate walking pace, stopping at various points along the tour. The guide can arrange to meet the group at their accommodation in town or from outside the Ennis Tourist Office which is just off the main square in the centre of the town and beside a large bus parking area. The tour consists of approx. 10 stops and will take in many of the major sights of the town of Ennis along the way including the O’Connell Monument, the old bow-ways, Old Abbey, Franciscan Friary, McParland Building, Chapel Lane church, the Market and much of the towns art and sculpture trail. Particular requests or customisation of the tour can also be accommodated. In addition the Gourmet Walking Tour will include a stop for food tastings. For private group rates please contact the owner/operator, Jane O’Brien.